Reeves DiVinere Wright handles petitions for several chapters of bankruptcy. Whether you are facing bill collectors, foreclosure, or repossession, filing for bankruptcy can allow you to cancel or pay off your debt while still allowing you to keep your property. Whether you qualify to file for Chapter 7 or Chapter 13 Bankruptcy, Reeves DiVenere Wright offers the guidance you need to establish a debt-free future. Do I need to hire an attorney to file for bankruptcy? 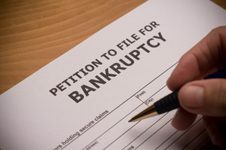 You may be able to handle filing your petition without an attorney, but there are several chapters of bankruptcy and it can be difficult to determine which is right for you. Contact Reeves DiVenere Wright to schedule an initial consultation meeting at no charge to determine your best option. There are several chapters of bankruptcy. The most common types for consumers are Chapter 7 and Chapter 13, explained in more detail below. Read more about Bankruptcy in this pamphlet from the NC Bar Association. Regardless of what bankruptcy filing you think you need, contact Reeves DiVenere Wright for sound legal advice on the best approach for your situation. Sometimes called “straight” or “no asset” bankruptcy, a Chapter 7 petition can cancel most of your debt while still allowing you to keep your car, home or a certain amount of “exempt” property. “Non-exempt” assets will be liquidated to pay off your debt. Generally, it takes the shortest amount of time to receive your discharge with Chapter 7. You can start rebuilding your credit about 100 days after filing. Chapter 13 is also known as “reorganization” bankruptcy. This petition restructures and sets up a repayment plan for your debts. Unlike Chapter 7, Chapter 13 petitions do not involve the liquidation of assets. Often, Chapter 13 petitions will be filed by those whose income or assets are too high for Chapter 7. Payments under a Chapter 13 generally occur monthly and last three to five years. Successful completion of the payment plan can result in a discharge of all pre-bankruptcy liabilities. No. All consultations dealing with Bankruptcy are free. Call our office and our highly qualified staff will be pleased to schedule a time for you to come in.